1. “Overview of the Shroud” by Robert Siefker. The presentation is a Critical Summary of observations, data and hypotheses related to the Shroud of Turin covering Historical Evidence, Medical Forensic Evidence, Linen Cloth Evidence, Image Characteristic Evidence, and includes a review and evaluation of the major Image Formation Hypotheses that have been proposed over the last 100 years. The presentation is based on a publication of the Turin Shroud Center of Colorado (TSC) that is headed by John Jackson (PhD in physics) who headed the landmark Shroud of Turin Research Project (STURP). The TSC publication is entitled “The Shroud of Turin: A Critical Summary of Observations, Data, and Hypotheses” which includes many pieces of data that trace their source back to the research conducted by the STURP team, as well as data from the broad spectrum of other scientific and historic research that has been conducted on the Shroud, both before and after the STURP expedition. 2. “CSI Jerusalem, Case of the Missing Body” by Russ Breault. A full documentation of the scientific evidence and the historical trail that supports the probable authenticity. Plus, a complete analysis of the Shroud as it relates to Scripture—a detailed depiction of the crucifixion ordeal, analysis of what may have happened in the tomb and an exploration of the post-resurrection body concluding with a study of Doubting Thomas and how his story relates to the Shroud. Appealing to both mind and heart, it is a compelling and inspiring presentation. 90 Minutes. 3. “The Crown of Thorns: The Paradoxical Lordship of the King of Kings” by Andrew Dalton. Following a description of the wounded head in the light of natural reason, I turn to the Biblical witness to explore the theological meaning of the crown of thorns. In short, we will see that: 1) Thorns first appear as a punishment for Adam’s sin (cf. Gen 3:18). 2) For Jesus, thorns are a metaphor for moral evil (cf. Matt 7:16f). 3) Thorns enter into the typological relationship between Isaac’s sacrifice and the death of Christ (cf. Gen 22). In Jesus, God provides the Passover Lamb, who takes away the sins of the world (cf. John 1:29; 1 Cor 5:7). Finally, deep irony lies behind the mock worship, “Hail, King of the Jews” (Matt 27:29): whereas worldly despots lord it over their subjects (cf. Mt 20:25), this good shepherd lays down his life to save his lost sheep (cf. John 10:11). Christ is an upside-down king in a paradoxical kingdom. Appropriately, he wears a crown of thorns. This presentation looks at the description of Jesus’ tomb as seen by Peter, and the Beloved Disciple (John 20) in light of Gospel themes, special vocabulary, the internal unity of the Gospel, and the revelatory message inherent in the scene as described. Its proposal for the proper translation of verse 7 differs from what one finds in standard Bible translations, because translators do not take these other matters into account. Scholar/commentators do, and reach different conclusions from translators at times. So, we propose: “He (Simon) observed the linen cloths lying, and the Sudarium, which had been upon his head, not lying with the burial cloths, but separate from view where it was at first.” In other words, the Sudarium was still within the shroud. No other way of understanding verse 7 can stand. What Peter observed was the outline of the Sudarium, repurposed as a chin band. This should be the starting point for evaluating whether the Shroud of Turin and the Sudarium of Oviedo comport with the biblical evidence. 5. “The Role of Epistemology in Approaching Truth in the Shroud of Turin” by Cheryl White. From the time of the ancient Greek philosophers through the Age of Enlightenment and the Scientific Revolution, man has presumed the existence of universal truth as something that is accessible and knowable. From the Platonic Doctrine of Forms that established the foundations of what would become a faith-based epistemology seeking ideal and perfect forms, to the Aristotelian universe of the Unmoved Mover using an epistemology of observation and external proofs found in nature, philosophy has progressed to incorporate each of these as means by which man comes to understand all aspects of life and his existence. Throughout late Classical Antiquity and into the High Middles Ages, philosophers such as St. Augustine and St. Thomas Aquinas assured that each of these epistemologies found further expression in western Christian thought. The Neo-Platonist St. Augustine and the Aristotelian St. Thomas Aquinas gave credibility to each of these approaches to knowledge, in a way that has continued to inform and influence man’s quest for truth. Over the centuries that have passed since the first mention of the Shroud of Turin in the documented historical record, these epistemologies have largely not been in competition for understanding this relic. The reason for this is found in the nature of the Shroud itself, which continues to reveal new information about itself as new and more sophisticated methods of science have developed. Until the late nineteenth century, those who venerated the cloth did so without knowing the fullness of the photographic image imprinted there, meaning they venerated from a standpoint of faith what they received to be truth, with no further external evidence. Following the exposure of the full image on the cloth, the epistemology applied to Shroud studies has shifted to one of science and empiricism, as it became obvious through observation that the Shroud was much more than a simple medieval forgery or odd artifact. Inquiry and ongoing exploration of the Shroud of Turin must be approached with respect for each epistemology, given their historical association with both man’s quest for knowledge and this specific relic itself. To date, each philosophical construct unnecessarily suffers from a suspicion of the other, and yet each falls short in answering the seemingly unanswerable. Through a historical and philosophical analysis of the ways in which man has approached this unusual and unique cloth, this paper will explore the implications of advancing both epistemologies for future study and progress toward truth. 6. “Physical Cause of Jesus’ Death” by Dr. Pietro Pescetelli. The Shroud of Turin is a source of information with forensic value. On the light of Synoptic Gospels and using the Shroud as an autoptic finding, the author assumes heart infarction and its complications, heart rupture and hemopericardium, to be the leading cause of Jesus’ death on the cross. 7. “Identifying the Tomb of Jesus for Turin Shroud Research” by Dean Schulz. A hypothesis has been proposed wherein particle radiation played a role in the image formation on the Turin Shroud and/or in the skewing of its carbon-14 dating [Antonacci 2001, 2015; Rucker 2016]. If so, and if indeed the man imaged on the Shroud was Jesus, then it would be important to analyze samples of the limestone in the correct tomb where his body and the Shroud were placed. If neutron radiation were involved, detecting the unnaturally occurring Calcium-41 isotope would be convincing evidence to substantiate the radiation hypothesis and associate the Shroud specifically with Jesus. So this paper examines several purported sites for Jesus' burial, evaluates their merit, and proposes sites for future sampling and analysis. 8. “The Mandylion in Constantinople: Literary and Iconographic Sources” by Alfonso Caccese, Emanuela Marinelli, Laura Provera, and Domenico Repice. The ancient Image of Edessa was moved to Constantinople in the year 944. This image, which is called Sindon in some sources, begins to be called Holy Mandylion right in the Byzantine capital. The solemn arrival in Constantinople is extensively described in the Narratio de Imagine Edessena attributed to the emperor Constantine VII Porphyrogenitus (10th century). The Sermon of Gregory Referendarius and the Codex Vossianus, both of the 10th century, describe the Edessa Image as the image of a whole human body. The Edessa Image is described in the Acts of Thaddeus with the term tetradiplon (folded four times). These testimonies contribute to validate the hypothesis that the Edessa Image is actually the Shroud, folded. The depictions of the Man of Sorrows that circulated in Constantinople during the period of the ascertained presence of the Edessa Image find the confirmation of their probable sindonic origin in the literary sources. The authors also investigate the relationship between the Holy Shroud and the new depictions of the suffering Christ that originate in Constantinople in the period of the presence of the Mandylion. The image of the dead Christ, emerging from a tomb with his arms crossed, begins to spread. The image of the crucifix is also transformed: the still-living Christ gives way to the dead Christ, who is also depicted when he has just been removed from the cross and put on a sheet. These depictions seem to be referring to a progressive knowledge of the true nature of the Mandylion: a cloth with the entire image of the dead Christ. The existence of the Throne of the Magnaura is well-known; we can hypothesize the existence of a similar mechanism to exhibit the Mandylion-Shroud with equal authority. To confirm what has been stated above, the authors present some significant iconographic testimonies. 9. “Who Saw the Mandylion and What was its Size?” by Mario Latendresse. The Abgar Legend recounts the story of the creation of a miraculous image. The Legend has evolved from a letter written by Christ to a miraculous image made directly on a cloth by Him. The Legend involves Abgar, King of Edessa, who is healed by the miraculous image. In 944, the Edessenian image is transferred to Constantinople and becomes known as the Mandylion, which is most often represented as a small cloth impressed with the face of Christ. Despite the work of many scholars on the origin and nature of the Mandylion, its exact size and appearance have not been conclusively settled. Some well-known scholars even proposed that the Mandylion could have been made of wood, contradicting the Abgar Legend. We address two specific questions: who saw the real Mandylion that arrived in Constantinople in 944? What was its size? Answering these questions requires a thorough study of many essential documents: The Abgar Legend; the medieval renditions of the Mandylion; the manuscripts describing the arrival and the keeping of the Mandylion in Constantinople; the pilgrim’s stories mentioning the Mandylion in Constantinople; the manuscripts describing the arrival and keeping of the Mandylion and its reliquary at the Sainte-Chapelle of Paris; and more. Was the Mandylion shown publicly? Did pilgrims of Constantinople really see the Mandylion? Were artistic representations of the Mandylion based on seeing it? Which documents and other Byzantine reliquaries allow us to recreate the reliquary of the Mandylion? Does the reliquary of the Mandylion reveal more about the Mandylion itself? Does the liturgy of the feast of the Mandylion reveal its physical nature? Did Robert de Clari see the Mandylion? These are some of the subsidiary questions that are addressed. It can be shown that many medieval artistic representations of the Mandylion are very likely based on the Abgar Legend and not on a direct access or knowledge of the real physical Mandylion. A typical example is manuscript MS 499 preserved at the Pierpont Morgan Library & Museum in New York City, because the Mandylion was no longer in the Middle East when the manuscript was produced at or near Constantinople. On the other hand, the icon of Abgar preserved at Saint Catherine’s Monastery in Egypt, on which Constantine VII plays the role of Abgar, could have been made with some knowledge of what the Mandylion looks like because Constantine VII had seen the Mandylion. The icon of Abgar appears to reveal a folded cloth, because the way Constantine VII holds the Mandylion, it can only be a heavy cloth, in which case the only reasonable conclusion is that it was folded. However, the artists producing the manuscript MS 499 and the Abgar icon are forced to abide to the Abgar Legend, because this is the exact context in which the Mandylion is shown, and only a face of Christ is mentioned in the Abgar Legend. Remarkably, most scholars studying the Mandylion ignore the documents describing its reliquary at the Sainte-Chapelle of Paris, but these documents are a precious source of information to elucidate the nature of the Mandylion. For example, the size of the reliquary is clearly mentioned by these documents, which shows that the Mandylion was unlikely a small cloth. These documents also reveal that it is unlikely that the Mandylion was kept in its reliquary showing only the face of Christ, but that the entire image on the cloth was hidden from view. 10. “Geoffrey de Charny’s Acquisition of the Shroud of Turin: Texts, Fictions, and Forgeries” by Jack Markwardt. In approximately 1355-1356, the Shroud of Turin was publicly exhibited in the small French village of Lirey. The manner in which its then-owner, Geoffrey de Charny, an esteemed knight, acquired the relic has remained unknown for more than six and a half centuries. Over the course of the last one hundred and fifteen years, various hypotheses have attempted to explain Geoffrey’s ownership of the relic, each of which proceeds upon the assumption that the Turin Shroud was the imaged sindon which, in 1203 and 1204, was publicly exhibited in Constantinople. This paper will analyze the fifteen most prominent of these theories and the historical texts, the historical fictions, and the historical forgeries upon which each of these narratives is based. It will examine the various proposed chains of ownership which run from the Byzantine emperor to Geoffrey de Charny, assess the plausibility of their component links, and review the multiple factors which determine whether such theories should be, or should not be, considered convincing. 11. “The Holy Shroud and Othon de La Roche: notes for a working hypothesis on the “Missing Years” (1204-1356)” by Alessandro Piana, read by Michela Marinelli. The Holy Shroud disappear from Constantinople during the Crusade in 1204. Some elements seems to confirm the presence of the Shroud in Athens since 1205 when, after the splitting up of the Byzantine Empire, Othon de La Roche, baron of Ray-sur-Saône, became Lord of Athens. Many tracks suggest that, after 1225, Othon came back into France with the Shroud. After his death, in 1234, the Shroud remained in Ray-sur-Saône family hands until its handing over to the de Vergy family. Thanks to Jeanne de Vergy, related in the fifth generation with Othon, the Shroud would have been shown in public in Lirey, France. 12. “There is no Evidence that Othon de la Roche Acquired the Shroud of Turin” by Mario Lantendresse. In 1714, the Jesuit Pierre-Joseph Dunod wrote a dissertation for the authenticity of the Shroud of Besançon, and that Othon de la Roche had acquired the Shroud of Christ during the Fourth Crusade. That dissertation is in manuscript 826 of the municipal library of Besançon. In 1902, Dom François Chamard modified the arguments of that dissertation concluding instead that Othon’s acquisition is the Shroud of Turin. In 1981, Pasquale Rinaldi presented a copy of a supposed letter of Theodore Angelos Komnenos Doukas to Pope Innocent III, supposedly written in August 1205, stating that the Shroud of Christ was being kept in Athens. Several researchers have claimed that a “family tradition” substantiates that a small coffer at the castle of Ray-sur-Saône had been used to transport the Shroud of Christ from Athens to France. These primary sources have been used to substantiate several theses for the transfer of the Shroud from the Middle East to the collegiate of Lirey. In this presentation, I show new evidences that these sources have no reliable historical foundation. 12. 13. “The Shroud of Turin and the Sainte-Chapelle of Paris” by Mario Latendresse. The provenance of the Shroud at Lirey, France, has often been considered obscure. However, there is a direct and natural route for its provenance by following the fundamental historical documents: the receipt of Humbert de Villersexel listing the relics of Lirey; the notice Pour Scavoir la Vérité; the statements of Marguerite de Charny and her father Geoffroy II; and documents related to the financial supports for the collegiate at Lirey. These documents lead to the relics in the Grande Châsse of the Sainte-Chapelle of Paris, which contained twenty-two relics received from Constantinople in 1239-1242. The only possible relic similar to the Shroud in the Grande Châsse is the Sanctam Toella tabula insertam (A Holy Cloth inserted in a table). I will present a detailed analysis of the French inventories of the Grande Châsse showing that the Holy Cloth likely disappeared from the Sainte-Chapelle before 1534. This analysis answers many objections that were raised against the thesis of the Sainte-Chapelle. Based on historical documents, I will also propose a new place and date for the transfer of the Shroud from King Philippe VI to Geoffroy de Charny. 14. “The image of Edessa included the whole body but only its empty reliquary arrived at Paris” by Cesar Barta and Jorge Manuel Rodriguez Almenar. It is proposed that the image of Edessa was inside the shrine covered with a Tallit. This originated the Aura of Jesus. When the Mandylion was moved to Constantinople, several references show that the image involved the whole body. The way to show this shroud described by Clary should be the origin of the Imago Pietatis. Some paintings of this last show the back of the man in the backside of the canvas. We propose a new hypothesis: the Mandylion kept in Edessa in a reliquary opaque becoming an empty reliquary in Constantinople. Only this empty shrine was sent to the Sainte Chapelle of Paris. 15. “The Simony Theory: The Passage of the Shroud of Turin from Constantinople to Lirey” by Jack Markwardt. If, as many believe, the Shroud of Turin was the sindon which bore a full-length image of Jesus and was publicly exhibited in Constantinople at the beginning of the thirteenth century, its movements and whereabouts during the so-called “Missing Years” (1204-1355) remain a mystery, as does the manner in which it came to be acquired by its first record owner, Geoffrey de Charny, a French knight who exhibited the cloth at Lirey in 1355 and 1356. This paper presents a completely new theory of the Shroud’s passage from Constantinople to Lirey, one which is entirely consistent with historical texts, presents plausible transfers of the relic, and explains why Geoffrey and the Church did not speak about the relic’s provenance, why the Pope imposed perpetual silence regarding the cloth, and why, for almost seven centuries, the “Missing Years” have been missing. 16. “Avignon and the Shroud of Turin: Authenticity Confirmed” by Jack Markwardt. The circumstances which surround the fourteenth-century exhibitions of the Shroud in the small French hamlet of Lirey continue to confound historians. The initial expositions go unreferenced in Vatican archives and appear to have proceeded without papal approval. With regard to the later expositions, the sanctioning Pope concealed his reasons for allowing them to take place, silenced a bishop who alleged the relic’s fraudulence, and issued three inconsistent bulls regarding how the cloth was to be described when exhibited. In addition, both the relic’s owners and the Church never publicly disclosed its provenance. This paper will resolve all of the mysteries which surround the Lirey exhibitions and demonstrate that, before they were permitted to commence, the Church determined that the Shroud of Turin was an authentic relic of Jesus Christ. For five centuries thereafter, the Vatican referred to the Shroud as Jesus’ actual burial cloth; however, for reasons which this paper will reveal, the Church now alludes to the relic as an icon, or image. 18. “Uncovering the Frailties of Ecclesiastical Authorities in the Holy Shroud Guild Archives” by Giorgio Bracaglia. The ultimate contribution by the Holy Shroud Guild was to lead an American team of scientist during the 1978 Ostension. The occasion marked the first time that Americans were part of an international collaboration in Shroud research. However, in less than two years, the relationship between the American scientists, and Turin's ecclesiastical became embittered. Many blame the dissent of Doctor McCrone, who insisted the Shroud was a painting, while others faulted Professor Gove beginning in 1977, for sabotaging STURP's involvement during the 1988 radiocarbon testing, or Father Filas announcement of the Lepton coin. As damaging as the McCrone, Gove, and Filas’ incidents appear, assessing the total summation of all the Guild's archives during the American cooperation there does emerge one underlying cause for the collapse of international collaboration. This presentation explores one episode of many that collectively demonstrates the cause that eroded the collaboration between the groups. In 2014 the EDICES opened up new palynological research on the cloths of the Sudarium of Oviedo, in the quest to find data at a taxonomic level and confirm the presence of pollen in the relic from ancient times. In previous research in 1994, the palynologist Gómez Ferreras identified palynomorphs from vacuumed powder; these were acetolysed and observed under an optical microscope, thereby discovering 141 number of pollen. After, using a method of vacuum and a special adhesive tape, new powder was collected, which at the present time is being analyzed with scanning electron microscopy. A notable discovery was the pollen type of Apiaceae (Fig. 1), as well as types of Pistacia spp. (Fig. 2) covered with greasy substances and immersed in dissolved frankincense. An interesting pollen sample was found adhered under a stain of blood, showing a pollen of Asteraceae, which suggest that flowers or some product were used when the blood was fresh. This pollen kind may belong to the genus Helichrysum (Fig. 3, photo realized by Dr. Alfonso Sánchez Hermosilla, of the Universidad Católica San Antonio de Murcia; Fig. 4, of the 1994 samples) (Boi, 2012). This pollen type, which also appears in pictures of the studies of Frei and Danin, is the pollen type that had previously been wrongly identified as Gundelia tournefortii (Frei 1982, 1983; Danin et al., 1999; Boi 2016). This last finding could help to relate the fabric of the Sudarium to the Shroud of Turin, because this latter relic also shows a high presence of entomophilous pollen (Boi 2016). The finding of pollen can help also to date the Sudarium of Oviedo, as well as, the Shroud of Turin. The Sudarium samples reveal a significant presence of entomophilous pollen as well as of anemophilous ones. The entomophilous types always appear wrapped by oily substances which not allow its identification; the anemophilous ones, instead, are free of oily substances. The entomophilous types came from plants which produce resin, gum and oil used in the ancient time for skin ointments, as for examples the species of galbanum (Ferula spp.) and Helichrysum used to produce balms for the funeral rituals mixed with frankincense and myrrh. The Helichrysum type and other entomophilous kinds were associated with resins, gum and oil used in ancient rituals, according to Pliny the Elder and Dioscorides, although the employed of botanical products to honour the dead was abandoned during the 3rd century A.D. The entomophilous pollen of Helichrysum discovered under the blood stain will be the confirmation that it is a primary source and it can be present since the first use of the cloth. This pollen discovering helps to find a probable relationship between the relics of the Sudarium and the Shroud of Turin. There is a variety of pollen on the Sudarium that need to link, in the same way, with Shroud samples. 20. “Uncovering the Sources of DNA Found on the Shroud of Turin” by Gianni Barcaccia. The main findings from the testing of genomic DNA extracted from dust particles vacuumed from distinct parts of the Turin Shroud are presented and critically discussed. Several plant taxa native to the Mediterranean area were identified as well as species with a primary center of origin in Asia, the Middle East or the Americas but most likely introduced in a historical interval later than the Medieval period. Regarding human mitogenome lineages, our analyses detected sequences from multiple subjects of different ethnic origins, which clustered into a number of Western Eurasian haplogroups, including some known to be typical of Western Europe (5.7%), the Middle East (55.6%) and the Indian sub-continent (38.7%). Such diversity does not exclude a Medieval origin in Europe but it is also fully compatible with the historical and geographical path followed by the Shroud during its presumed journey from the Near East. 21. 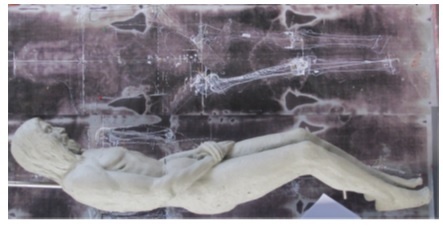 “Use of the VP-8 Image Analyzer with a photograph of the Shroud of Turin exhibiting 3D results” by Janis Winchester. This research uses a VP-8 Image Analyzer, manufactured by Interpretation Systems Inc., with a photograph of the Shroud of Turin. The image emerging on the oscilloscope of the VP-8 shows the information embedded on the fibers of the image on the Shroud of Turin. The findings detail the pattern of the discolored fibers that show wounds of a spear entrance and exit point and other marks of a man who died by crucifixion. The unique feature is the 3D appearance from the 2D photograph of the Shroud of Turin. No other photograph shows this characteristic. A thank you is extended to Shroud Researcher Mr. Kevin Moran for the use of his VP-8 Image Analyzer, and assisting with a video for this presentation. 22. “The “Other Images” on the Shroud of Turin” by Paolo Di Lazzaro and Daniele Murra. The faint body images on the Turin Shroud are not evident at naked eye. To make them more visible, it is necessary increasing the contrast, e.g., by image elaboration software tools. When increasing the image contrast it is easy creating false pixels, that is, pixels originally having an intermediate grey level that do not contribute to the image, which are arbitrarily transformed in black or white pixels. Human perception system can elaborate and join ensembles of false image pixels to find a similar image in our memory, thus giving them a meaning possibly coherent with our expectation given by the context (psychology of Gestalt) in a well known mind process called “confirmation bias”. As a final outcome, our mind tries to make sense out of any "pattern" our eye can see. This automatic and unconscious illusory process is known under the general umbrella of Apophenia or Pareidolia. Subjective perception and elaboration of false pixels is a topic deeply studied because it may have a dramatic impact in radiology and medical imaging (possibility of wrong diagnoses) as well as in forensic science (possibility of wrong fingerprints identification and biased pattern analyses). In this talk we will present a less dramatic application of the science of perception, namely the study of the “other images” on the Shroud (coins, flowers, anatomic details, images on the back of the cloth) that are invisible at naked eye but emerge after image processing of photographs of the Shroud. We will discuss the probability they are really present on the cloth or rather they are clever products of our mind. This is an important line of research, because, if confirmed, some of these invisible marks would provide a clue of the origin of the Shroud far more important of any other scientific investigation. A final part will be devoted to present and comment the results of tests that allowed to reveal the psychological processes underlying the perception of religious artifacts under data-limited conditions. This knowledge may be important to assess the perception of the “other images” on the Shroud. P. Baima Bollone: “Images of extraneous objects on the Shroud” Sindon N.S. n. 13 (June 2000). P. Di Lazzaro, D. Murra: “Shroud like coloration of linen, conservation measures and perception of patterns onto the Shroud of Turin” SHS web of conference, vol. 15, 00005 (2015). P. Di Lazzaro, D. Murra, B. Schwortz: “Pattern recognition after image processing of low-contrast images, the case of the Shroud of Turin” Pattern Recognition vol. 46, 1964-1970 (2013). D. Murra, P. Di Lazzaro: “Sight and brain, an introduction to the visually misleading images” Proceedings of the International Workshop on the Scientific approach to the Acheiropoietos Images (2010, ENEA). M. Sheen, T.R. Jordan: “Effects of contextual information on seeing pareidolic religious inscriptions on an artifact: implications for the Shroud of Turin” Perception vol. 44 1427-1430 (2015). 23. “Numismatic dating of the Turin Shroud through the analysis of Byzantine coins” by Giulio Fanti. The 1988 radiocarbon dating of the Turin Shroud (TS) assigned a calibrated calendar age of 1260-1390 A.D. with a 95% confidence for the linen fabric, but three recent alternative dating methods assigned an age compatible with the First Century A.D., the period in which Jesus Christ lived in Palestine. The present analysis is based on the face and on the posture of Christ reported on many Byzantine coins that clearly demonstrate that the TS was seen starting from 692 A.D., the year in which the emperor Justinian II represented the face of Christ on the coins for the first time in the history. It is interesting to observe that, as not all the peculiar details of the TS face were represented in such a small depiction of a coin, the choice of which detail had to be considered was let to the single engraver. Therefore, we can see coins made by different officials, under the same emperor, showing different details, all typical of the TS face, but with different faces of Christ. With the time passing, not all the engravers had the possibility to observe directly the TS; as a result, a degradation of the similarity with the TS of the produced face of Christ results. Nevertheless, when the TS was taken to Constantinople in 944 A.D., we detect a great improvement of the partially lost similarity. This is also demonstrated by an analysis based on the variation of the ratio between eyes distance and nose length. From a probabilistic analysis, it results that the Byzantine engraver who represented Christ on the gold solidus, semissis, tremissis and silver hexagram during the period of Justinian II would have only seven chances in one billion of billions of different possibilities of hitting these peculiar features all together without having seen the TS; this demonstrates that the TS was seen in the first Millennium A.D. The paper also presents a tracking shot of the various features, different century by century, but all in agreement with the TS body image, reported in the Byzantine coins up to the fall of the Byzantine Empire in 1204 A.D. and in the following centuries, evidencing the various features of the TS image frequently reproduced in accordance with Byzantine canons. 24. “Hypothesis of face-cloth wrapping of the Turin Shroud Man: experimental and numerical results” by Matteo Bevilacqua, Gianmaria Concheri, Stefano Concheri, Giulio Fanti and Sergio Rodella. Previous results of Mario Azevedo and by Petrus Soons show deep hollows not easy to explain in a hypothesis of flat or cylindrical wrapping of the Shroud face. New experimental results have been performed on the Rodella’s life-size sculpture. The following figure shows two wrapping configurations of the face of the life-size sculpture representing the Shroud Man with a high-contrast copy of the Shroud. Folds are evident in the mouth-beard area and on the forehead. After the superimposition of two scans of the face and the cloth, the resulting face-cloth distance is less than 1 cm from Shroud image; folds result in correspondence of the left forehead and near the right mouth-beard area just where M. Azevedo and P. Soons found deep hollows. Also a numerical result confirms the presence of folds near the mouth-beard area. These results are in favor of the hypothesis of a tight wrapping of the TS with an image-extinction-distance less than one cm. 25. “Politics of the Shroud C-14 Dating” by Joe Marino. In 1978, the Shroud of Turin Research Project spent five days studying the linen cloth believed by many to be the burial cloth of Jesus of Nazareth. The group found no evidence that it was a forgery and was unable to determine how the image had been formed. In 1988, laboratories in Tucson, Oxford and Zurich performed a radiocarbon dating on the Shroud of Turin with resulting dates of AD 1260-1390. Using multiple sources, including first-hand accounts by individuals involved in the dating, and a recently-discovered 1989 doctoral dissertation containing startling admissions from some of the principle characters, this paper will show in chronological fashion how the search for the truth of the real age of the Shroud of Turin was compromised by personality conflicts, questionable actions by participants, contradictory and concealed data, and broken protocols. The data recounted indicate that the C-14 results should not be accepted as valid. 26. “Invisible Reweave on the Shroud: Evidence For” by Joe Marino. When the 1988 Shroud of Turin C-14 dating results were announced as AD 1260-1390, some researchers, based on previous data collected, especially by the 1978 Shroud of Turin Research Project (STURP) that showed no indication that the cloth was a forgery, suggested that the area from which the C-14 sample had been taken was a repaired area. In 2000, the author, along with his late wife Sue Benford, presented an in-depth paper about the possibility of a repair at a conference in Orvieto, Italy. The late Ray Rogers, a chemist on the STURP team, thought that the hypothesis was nonsense and set out to prove us wrong, as he had samples from the C-14 area as well as the main body of the Shroud. To his surprise, the data he found supported the repair hypothesis. Evidence pointing to repairs is also presented from other important sindonologists. 27. “Was the Shroud of Turin Invisibly Rewoven with Foreign Material at the Radiocarbon Site to Match the Rest of the Cloth?” by Mark Antonacci. This presentation discusses the evidence on the Shroud or its samples of an "invisible" reweave or the presence of any added dye or coating on any material added to the Shroud at or near the vicinity of its 1988 radiocarbon site. 28. “Dating Techniques other than Carbon Dating” by Giulio Fanti. 28a. 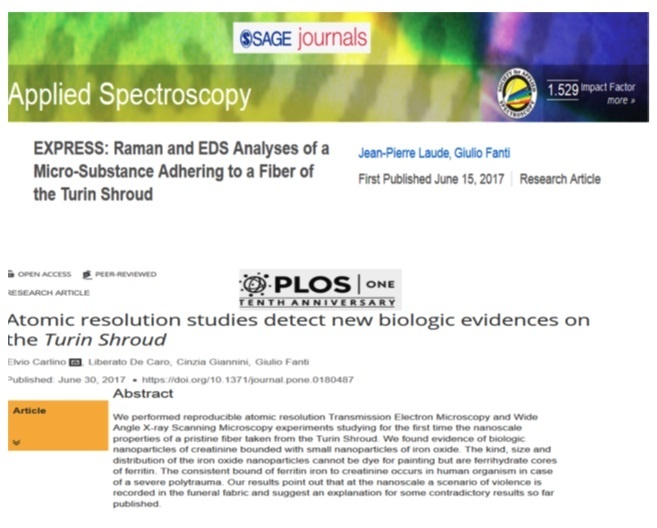 Recent Discovery of Torture Products in Blood on the Shroud The paper of June 15th 2017 published in Applied Spectroscopy discusses the Raman spectrum of a micro-substance smeared on a Shroud fiber (1HB) and detected the presence of a Biliverdin-derived compound. Biliverdin is an oxidative product of blood. The paper of June 30th 2017 published on Plos One, reports on a study performed on a linen fiber of the Shroud, confirming that it is the funeral fabric that wrapped Jesus of Nazareth after being crucified. The paper demonstrates the presence of torture products in blood on the Shroud, including creatinine with ferritin which is a degradation of the muscular fibers, and biliverdin which is a degradation of the hemoglobin in the blood. These products indicate that the man whose image is on the Shroud was heavily tortured. 28b. Main Presentation. Many papers have been published by the author (see References) and the results are shown in the figure. The Shroud has been dated by using mechanical and chemical methods (FT-IR and Raman). The methods have been calibrated by using samples of known age (from Egyptian mummies to recent textiles). For the mechanical dating it was built, improved and calibrated a special machine able to measure the tensile stress of single linen fibers cyclically loaded. All the various methods employed for dating furnish a date of the Shroud compatible with the first cnientury A.D., confirming the wrong result published in 1989 after the radiocarbon dating. They also show that the age in which the Shroud was used to envelope the body of Jesus Christ in Palestine corresponds to the first Century A.D. as reported by the Gospels. 1. G. Fanti, P. Baraldi, , R. Basso, A. Tinti, Non-destructive dating of ancient flax textiles by means of vibrational spectroscopy, Vibrational Spectroscopy (2013). 2. G. Fanti, P. Malfi, “A New Cyclic-Loads Machine For The Measurement Of Micro-Mechanical Properties Of Single Flax Fibers Coming From The Turin Shroud”, AIMETA Congress, Torino, 2013. 3. G. Fanti, P. Malfi, “Multi-parametric micro-mechanical dating of single fibers coming from ancient flax textiles”, Textile Research Jou. (2013), SAGE Pub., Volume 84 Issue 7 May 2013. 4. R. Basso, G. Fanti and P. Malfi, “A new cyclic-loads machine for the measurement of mechanical parameters of single flax fibers coming from the Turin Shroud for dating purposes”. Proc. of 27th Int. Congr. Condition Monitoring and Diagn. Eng., Comadem 2014, Brisbane, Australia (2014). 5. G. Fanti, P. Malfi, “The Shroud of Turin – First century After Christ!”, Pan Stanford Publishing Pte. Ltd., Singapore, 2015. 6. G. Fanti, P. Malfi and F. Crosilla, “Mechanical ond opto-chemical dating of the Turin Shroud”, MATEC Web of Conferences, Volume 36, 2015, Workshop Of Paduan Scientific Analysis on the Shroud (WOPSAS 2015) Article Number 01001. 7. R. Basso, G. Fanti and P. Malfi, “Monte Carlo method applied to the mechanical dating of the Turin Shroud”, MATEC Web of Conferences, Vol. 36, 2015,Workshop Of Paduan Scientific Analysis on the Shroud (WOPSAS 2015), Article Number 01003. 8. Fanti G. , Basso R., “An Improved Test Machine for Mechanical Characterization of Linen Fibers: the Turin Shroud Dating” Proc. of 22nd ISSAT, Int. Conference on Reliability and Quality in Design,Los Angeles CA, 04-06 August 2016, Ed. ISSAT, Piscataway, NJ, p. 15-19. 9. Fanti G., Basso R., “Mechanical Characterization of Linen Fibers: The Turin Shroud Dating”, Int. J. of Reliability, Quality and Safety Engineering, April 2017, Vol. 24, No. 02. 29. “Statistical Analysis of the 1988 Carbon dating” by Bob Rucker. In 1988, samples were cut from the bottom corner of the Shroud and sent to three laboratories for C14 dating. Statistical analysis of the results was published Feb. 16, 1989 in the British Journal Nature (P. E. Damon, et al). The average value obtained by the three laboratories (1260 AD) was based on the assumption that only random measurement errors were causing the variation in the measurements, but detailed statistical analysis indicates there is only a 1.4% probability of this being true. This means that it is highly likely (~98% probability) there was also something affecting, or biasing, all the measurement values as a function of some parameter, i.e. it was not random. In statistical analysis terminology, this is called a systematic (in contrast to random) bias. The statistical analysis reported in Damon did not recognize the presence of this systematic bias. Since the presence and nature of this systematic bias was not recognized, the effect of it could not be corrected for in the measurement values. Therefore, the C14 dates should not be regarded as accurate because the measured values were not corrected for whatever was affecting them, i.e. the systematic bias. 30. “The Neutron Absorption Hypothesis” by Bob Rucker. Detailed statistical analysis of the C14 dates indicates that something other than random measurement error was affecting the measurements. Plotting the average values from the three laboratories indicates that the C14 dates change by about 36 to 38 years/cm (91 to 97 years/inch) as the sample point moves away from the bottom edge of the Shroud and toward the center of the body mass. There is much evidence that the straw-yellow discoloration on the Shroud was caused by a burst of radiation from the body. If this burst of radiation included neutrons, then the shape of the neutron distribution in the tomb as calculated by the MCNP nuclear analysis computer software would have caused the 36 to 38 years/cm slope in the calculated values by the [N14 + neutron [Symbol] C14 + proton] reaction. The hypothesis that neutrons were included in the burst of radiation explains the four things that are known about C14 dating and the Shroud (1260 AD date, slope of 36 to 38 years/cm, range of the measured values: 1155 to 1410 AD, and a 700 AD C14 date for the Sudarium of Oveido). The alternate explanation of an invisible patch or reweave is only supported by the first two items. 31. “Art, Icon, or Relic” by Russ Breault. This is a presentation on the role of art in exploring and revealing an ancient mystery. Is the famous Shroud of Turin the work of a medieval artist? Is it a religious icon or is it a relic of a historical event? This comprehensive presentation will look at art as historical depiction, art copies of the original, the influence of the Shroud on Byzantine art, comparison of art during the middle ages, and mechanics of art such as style, technique, substances and process. This presentation includes over 200 images. 90 minutes. Sitting left to right: Robert Siefker, Mark Antonacci, Joe Marino, Bob Rucker, and Janis Winchester, with Cesar Barta standing to the left for one question. 33. “Image Characteristics” by Giulio Fanti. Among many others, the presentation focuses on the following 24 characteristics of the body image covered by blood [G. Fanti, “Hypotheses Regarding the Formation of the Body Image on the Turin Shroud. A Critical Compendium”, JIST (2011), http://dx.doi.org/10.2352/j.imagingsci.technol.2011.55.6.060507] that help formulating a quite reliable hypothesis of body image formation. C1. The front and back images of the body show almost the same color intensity (yellow-brown), i.e., at first sight, we cannot appreciate which image is the more evident, front or back. C2. The body image has the normal tones of light and dark reversed, so that the body parts nearer the cloth are darker. This fact leads us to state that the body image appears as a photographic negative. C3. The luminance distribution of both front and back images can be correlated to the clearances between the three-dimensional surface of the body and a covering cloth (Fig. 3). This is why many state that the TS is a 3D image. C4. A body image is visible in areas of non-contact zones between body and sheet, for example, the nose and cheek areas (Fig. 4). C5. The front image, at least near parts of the head, is doubly superficial4 (Fig. 5). This means that the 0.34-mm thick fabric presents a superficial image on one side (about 0.03 mm thick), no image in the middle, and another superficial image on the other side. C6. The body image has a resolution of 4.9±0.5 mm but no well-defined contours. This means that human details such as the nose, lips and beard are clearly defined, but that the body image seems to disappear if someone looks at it from a distance closer than about one meter. C7. The convex “hills” of the face (e.g., eyeballs and tip of the nose) are more clearly represented than the concave hollows; the tip of the nose is one of the most evident. C8. The body image does not fluoresce when viewed under ultraviolet radiation. C9. The TS enveloped a dead human body. C10. Image distortions of hands, calves and torso on the TS correspond to those obtained by a man wrapped in a sheet. C11. The pronounced rigor mortis of the body is evident, especially on the back image near the buttocks. C12. The image shows no signs of putrefaction. C13. The hair is soft, not matted, as would be expected if it had been soaked with aromatic substances and blood. C14. The linen fibers of the image lie only on the uppermost portions of the threads, leaving the inner fibers uncolored. C15. The coloration does not appear under the threads where they cross in the weave of the cloth. C16. The fibers of the image are adjacent to un-yellowed fibers: striations are evident. C17. Color is concentrated in the crevices where two or more threads cross each other. C18. Color lies on the 0.2-micrometer thick layer interpreted as the primary cell wall of the fibers; the cellulose of the medulla is colorless. C19. The fibers are uniformly colored round their cylindrical surface, whereas variations in color intensity can be detected along the fibers. C20. In contrast to the bloodstains area, there is no cementation between fibers or signs of capillary flow in the image areas. C21. Many tests, including X-ray fluorescence, reflectance spectrometry and low-energy/high-resolution X-ray transmission, have shown that the body image is not compatible with a painted image. It is only due to chemical reactions of the polysaccharides composing the linen fibers: oxidation, dehydration and conjugation. C22. The red stains are those of human blood, frequently surrounded by serum haloes. This was due to transposition of blood clots by fibrinolysis. C23. Bloodstains appear on and outside the body image, indicating that some blood drained from the corpse to the fabric. C24. No image can be found under the bloodstains, because they formed before the body image. Various hypotheses of the body image formation of the Shroud have been shortly commented in view of 24 peculiar characteristics. Radiation is the best hypothesis and, Corona Discharge (CD) is preferred, although no complete results can be obtained. CD may be caused by a (ball) lightning, earthquake or radioactive environment (radon), but perhaps the truth is beyond science. Shroud imaging by CD may also be a by-product of the Resurrection, and this may be why the image cannot be reproduced. 34. “Investigating the Color of the Blood on the Shroud of Turin” by Paolo Di Lazzaro, A. Di Lascio, P. Iacomussi, M. Missori, and D. Murra. One of the most puzzling scientific problems of the Turin Shroud (TS) is the carmine color of the bloodstains, despite they are on the linen cloth since several centuries ago, to say the least. We do not know any other old bloodstain on cloths that is still colored carmine. This simple observation rules out “physiological” explanations and opens two different hypotheses: the bloodstains contain a mix of blood (as found by Baima Bollone and independently by Heller and Adler) and a reddish paint (as found by McCrone), or, in alternative, the blood marks on the TS were exposed to a unique factor that changed the blood chemistry. As an example, Goldoni proposed the hypothesis that the high concentration of bilirubin in the bloodstains on the TS could be responsible for the unusual color of the blood marks, after an irradiation of ultraviolet (UV) light suitable to activate photo-chemistry reactions of bilirubin with, e.g., carbon monoxide. In this presentation we will detail two unpublished results that test both hypotheses, to some extent. In the first experiment we have irradiated fresh human bloodstains on linen by UV laser pulses having the same intensity and laser parameters that allow a Shroud-like coloration of linen. The blood had very high endogenous bilirubin level, about 8 times larger than the normal range. We have measured the RGB values of bloodstains immediately before and after UV irradiation, and 30 months after irradiation, to check long term effects, if any. In the second study we have found tiny spectroscopic clues comparing the reflectance spectrum of the blood on the TS measured by Soardo et al. with the absolute reflectance spectrum of the marks simulating blood on the Shroud of Arquata, a 1:1 copy of the TS dated back to 1653 AD. The comparative analysis has been extended to the spectral reflectance measurements performed in 2015 just before the Shroud exhibition. 35. “Chemistry of the Image Imprinting Process” by Jose Carlos Godinez. The Turin Shroud is a linen cloth basically made of cellulose. During its bleaching process, a very thin coating of carbohydrates (hexoses) would have been deposited on its surface. Spectroscopic analysis and micro chemical tests on the image area, concluded that aldehydes and carboxylic acids were the only groups allowed to be at the image chromophore having a double bond conjugated system that resulted from the oxidation and dehydration of cellulose or hexoses. The image is not a scorch, however Hydroxymethyl furfural (HMF) was detected in the pyrolysis mass spectrum. HMF is not solely a pyrolytic product, its formation can also be induced by the photochemical degradation (radiation) of carbohydrates in a Hydrogen rich environment. The HMF because of its yellow sepia color and a carbonyl conjugated system, can here be proposed as the image chromophore. There is at the image a 131 amu unknown compound. If it is assumed that a Hydrogen strangelet (5 amu) is forming part of the HMF nuclei (MW 126), or just trapped within, it can account for the unknown 131 molecule. 36. “Naturalistic Processes for Image Formation” by Mark Antonacci. This presentation discusses the success or lack of success of naturalistic methods in duplicating the various features on the Shroud's body images and their blood marks. 37. “Role of Radiation in Image Formation” by Bob Rucker. To understand the image on the Shroud, it is necessary to understand the role of information and radiation. Three things were required to form the image on the Shroud: a discolorization mechanism, energy to drive the mechanism, and information to control the mechanism. The information that defines the appearance of a naked crucified man must have been deposited on the Shroud to control the discolorization mechanism. This information must have come from the body. The only option to transported or communicated this information from the body to the Shroud appears to be radiation. Other options for communicating information from one location to another would not work for the image on the Shroud. The radiation that communicated the information to the Shroud regarding the appearance of a naked crucified man could also have provided the required energy to drive the discoloration mechanism. The presence of bones in the Shroud image indicates that the radiation was evidently emitted from within the body. The good resolution images of the front and back of the body, without side images, indicates the radiation was evidently vertically collimated both up and down, like a million vertically oriented lasers going off at once in the body. According to the project STURP and other studies, the Shroud of Turin is not a fake, but its mere existence cannot be explained by science, and especially the remarkable body image that covers its entire length remains a mystery. Here, this serious impasse has been overcome by resorting to a virtual Matter-Antimatter Annihilation process, where the body of the Man of the Shroud disintegrates totally and soon after is restored anew with delivery of a small amount of energy, as allowed by the CP (Charge-Parity) violation, which is spent to mark the Shroud as it looks today. However unlikely this process may seem; its consequences are in a surprising agreement with the experimental evidences. The present hypothesis went a long way to address the ultimate quest of the hidden aspects of the Shroud, but the uniqueness of its marks is still posing insurmountable difficulties for our limited knowledge concerning the still foggy boundaries between life and death. 40. “A Geometric Mechanism for the Image Formation on the Shroud of Turin” by Mario Latendresse. The image formation mechanism on the Shroud of Turin can be divided into two components: the geometry of the mechanism and the physicochemical mechanism forming the image on the cloth. This division is useful to study the image formation mechanism on one component at a time. The physicochemical mechanism would explain the color of the image, the superficiality of the image on the cloth, the physical modification of the linen fibrils, and more, as can be determined by chemically and physically analyzing the linen fibrils. This presentation does not address this component. The geometry of the mechanism would explain the positions of the body relative to the cloth when the image formed and possibly the dynamic of the cloth before and after the image formed. This mechanism would establish geometrical properties between the body/cloth relationship and the characteristics of the image such as the intensity of the color of the image on the cloth. This presentation focuses on this component. All geometric mechanisms proposed so far by several researchers proceeds in two steps. First, the bloodstains formed by direct contact when the cloth draped the body. Second, the image formed not long after. Different mechanisms have been proposed for this second step, postulating that the cloth did move before or during the image formation. In the former case, the upper half of the cloth would have been completely flattened above the body before the image formed, whereas in the latter case, the body would have disappeared and the cloth would have collapsed while the image formed. In this presentation, I will show that the cloth did not move before or during the image formation because such movements of the cloth are incompatible with the location of the bloodstains relative to the image. A cloth naturally lying down on the body when the image formed is coherent with the characteristics of the image and the location of the bloodstains. The geometric mechanisms postulating the movement of the cloth try to explain either the absence of any major distortion in the image or try to move some bloodstains over some specific locations (e.g., the bloodstains seen in the hair coming instead from the cheeks). However, it has never been shown that major image distortions would necessarily result from the image formed while the cloth naturally lay down on the body. It has also never been shown that the bloodstains seen in the hair must come from the cheeks. In other words, there is no necessity to have the cloth being moved before or during the formation of the image. Indeed, it will be shown that the bloodstains seen in the hair, near the cheeks, may very likely have come from the hair. The characteristics of the blood flow do not preclude this possibility. Moreover, the photograph of the underside of the Shroud of Turin, taken in 2002, shows that these bloodstains did not abundantly seep through the cloth, which is compatible with a light pressure against bloodstains coming from the hair, not the cheeks. The dorsal image of the Shroud does not show any flattening of the flesh that would result from the weight of the body lying on the cloth. We propose an explanation based on the rigidity of the legs and where both extremities of the body would be in strong contact with the Shroud, but not the rest of the body. The projection of the image of the body to the cloth can be explained by a simple general rule that does not depend on gravity or any orientation of the body. The simplest rule based on the shortest distance from the body to the cloth without any reference to orientation such as « a projection orthogonal relative to gravity » is sufficient to explain the 3D image and the lack of images from the sides of the body. Preliminary computer simulations of image formation from 3D objects reveal that the proposed geometric mechanism is possible. 41. “Linen Coloration by Pulsed Radiation, A Review” by Paolo Di Lazzaro and Daniele Murra. In 2010, the first laboratory demonstration that very short and intense bursts of Vacuum Ultraviolet radiation were able to generate a Shroud-like coloration at the microscopic level attracted a worldwide attention from media. It is time to rewind the tape and put those experimental results in their proper context: the motivations of the work, the search for the optimum (but difficult to achieve) working point, the photochemistry clues, the repeatability of the results, the scaling up from coloration to image production, what our results have really shown from a strictly scientific point of view, what are the implications in other areas such as philosophy and metaphysics, what journalists (and some scientists too) have misunderstood. The talk proposes a fascinating trip in 10 years of experimental attempts, efforts, intuitions, insights, accomplishments, disappointments, controversies. In three words, “the scientific method” applied to a metaphysical question. G. Baldacchini, et al. : “Coloring linens with excimer lasers to simulate the body image of the Turin Shroud” Applied Optics vol. 47, 1278-1283 (2008). P. Di Lazzaro, et al. : “Deep Ultraviolet radiation simulates the Turin Shroud image” Journal of Imaging Science and Technology vol. 54, 040302-(6) (2010). P. Di Lazzaro, et al. : “The conservation of the Shroud of Turin: optical studies” Energia, Ambiente e Innovazione, special issue on Knowledge, Diagnostics and Preservation of Cultural Heritage, 89-94 (2012). P. Di Lazzaro, et al. : “Superficial and Shroud-like coloration of linen by short laser pulses in the vacuum ultraviolet” Applied Optics vol. 51, 8567-8578 (2012). P. Di Lazzaro: “Coloration similaire à celle du Suaire d’un tissu de lin par un rayonnement ultraviolet” Revue Internationale du Linceul de Turin n. 39, 32-43 (2016). 42. “Chromosome acting as loop antenna matches wavelength for colorization of Shroud of Turin” by Tony Fleming. This presentation asks the question whether there a biological reason for the coloration of Shroud-like linen that was found using a single ArF Excimer laser as reported by Paolo Di Lazzaro and a number of others in 2010 and 2012? Supposing the Shroud to be authentic, we can also ask whether there a connection between the coloration of the image found on the Shroud of Turin and the biophysics within TSM’s (Turin Shroud Man’s) body? Another way of asking this question is: could the many chromosomes within TSM’s Body have acted as tiny lasers, many little loop antennas all over the Body emitting UV light perpendicularly outwards from within TSM’s skin thus forming the image on the Shroud? This present study looks at the possibility that TSM’s chromosomes may have reacted with the Shroud since the wavelengths of both are very close to each other, the chromosomes in TSM’s body and the ArF Excimer laser. 43. “Image Formation by Corona Discharge” by Giulio Fanti. Many hypotheses have been carried out on linen fabrics to explain the formation of the body image, but for the moment no solution has been found. In 1983, Osvald Scheuermann proposed a possible body image formation mechanism based on Corona Discharge (CD), followed by I. Bensen(1984), R. Morgan and G. Coote (1985), J.B. Judica Cordiglia (1986), E. Lindner (1997), F. Lattarulo (1998), A. Adler (1999), G. De Liso 2000, G. Fanti (2005) and others. A CD is an electrical discharge brought on by the ionization of a fluid. A current develops between two high-voltage electrodes in a dielectric fluid, usually air, by ionizing the fluid so as to generate a plasma around one electrode. The generated ions are used as charge carriers to the other electrode. An atom is ionized if it is subject to a strong electric field: it generates a positive ion and an electron. A TS-like image has been obtained by using CD in a proper set-up at Padua University and a half-life conductive manikin. Although electrons are the medium that triggers the process, it is the UV light and heating that produce the image: they react with the linen fibers, and break their C=C chemical compounds. There are many evidence in favor of a CD hypothesis of image formation. Among them the image has striations along the linen yarn. This is not simple to explain if any radiation composed of uniformly distributed photons is hypothesized. Like the Shroud, CD causes a doubly-superficial, negative and 3-D body image. The color corresponds to a dehydratation and oxydation of polysaccharides, as detected on the TS image. Experimental tests allowed to obtain an image after 24 hours of CD and ironing for 60 s at a 180 ±15 °C and numerical results confirmed the possibility to obtain body images quite similar to that of the Shroud (see figures). Theoretical and numerical results are in favor of the hypothesis of TS body image formation by CD. At microscopic level, the CD image is similar the Shroud. Similarities at macroscopic level are also: negative type, 3D features and resolution. The experimentally detected distortion must be studied in the future. 44. “Experimental Effects of Coronal Discharges on Linen” by Michael Schaffer. Plasmas can leave a permanent, yellow discoloration in very shallow layers on linen surfaces, very similar to those measured on the Shroud of Turin image. Fanti and colleagues have strengthened the case for a plasma role by experimentally forming Shroud-like images on a linen-draped, 3D manikin using corona discharges. Thus inspired, I treat two topics. (1) How to produce about 1 cc of low power plasma in ambient air, in order to expose small linen or other samples without carbonizing them? So far, my plasmas are too small, filamentary and concentrated. (2) What natural energy source might power plasma in a tomb in ~30 A.D.? I researched lightning literature and confirmed that even in 3D, lightning’s electric field penetrates about as deeply as the common 1D electric skin depth. In dry limestone this is typically tens of meters deep, enough for a strike to make a strong field inside a nearby tomb or cave. Thus, a role for lightning is not ruled out. 45. “Free Electron Model of Image Formation on Shroud of Turin” by Chuck Rogers. A theoretical study is made of expected consequences should a dead body wrapped in a linen cloth be pulled into a universe of higher dimensionality. A Free Electron Model of Image Creation is proposed to explain how its disappearance might create an image on linen. An interface is assumed to open up along the body’s midplane and to extend laterally to its edges. This interface expands to swallow the body, while leaving void populated by free electrons that create charged layers on interior surfaces. When an interface reaches skin, electrons moving in front of it burst out of the body cavity to cast shadows of surface features onto cloth. Photon radiation is generated. Low conductivity of linen keeps charge fixed in place long enough for fibers to oxidize without distorting electronic shadows. Attenuation of electrons in air reduces charge deposited behind air gaps. Patterns of oxidation combine with charge-free areas behind air gaps to create an image of an entire man. At first invisible, the image turns straw-yellow over time and becomes visible. 46. “Image Formation by Protons” by Arthur Lind. The cause of the image on the Shroud of Turin appears to be an image not formed by human hands. Because the Shroud radiocarbon dated to 1325, it has been suggested that during the resurrection Christ’s body dematerialized and in doing so both neutrons and protons were emitted. The neutrons reacted with the nitrogen in the Shroud to produce radiocarbon, making the radiocarbon date appear to be 1325. The protons produced the image. This presentation will examine if the image could have been formed by high energy protons. 47. “Evidence for Image Formation by a Cloth Collapse Model” by Mark Antonacci. 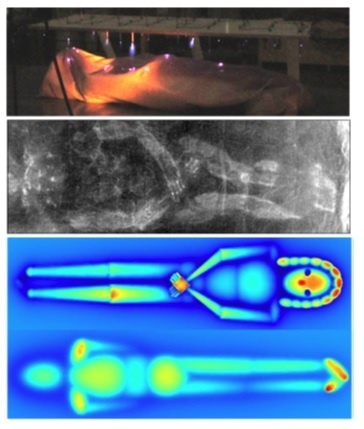 This presentation discusses the differences between cloth-collapse hypotheses and other radiation based hypotheses as well as the evidence on the Shroud that its body images, blood marks and other notable features were encoded by a cloth-collapse model. 48. “Problems with the Cloth Collapse Hypothesis for Image Formation” by Bob Rucker. According to the cloth collapse hypothesis, when the body disappeared, the forces of gravity and air pressure difference would have caused the cloth to collapse through the “radiant region” where the body had been. The passage of the Shroud through this radiant region would have caused radiation in the region to discolor the cloth causing the image. There appear to be several problems with this concept: 1. Gravity only works downward so would not cause the dorsal side to go up into the radiant region. 2. In a very rapid disappearance of the body there may not be sufficient air flow to the outside of the bottom cloth to cause it to collapse. 3. A slow body disappearance may not produce a sufficient air pressure difference to move the cloth. 4. A significant air pressure difference would also cause the sides of the cloth to collapse, but there are no images of the sides of the body. 5. Radiation, whether particles such as protons or electrons, or photons such as ultra violet, moves much faster than a collapsing cloth could move. Thus, before the cloth had moved significantly, the radiation would have gone through the Shroud leaving no radiation within the so called radiant region. Whether the cloth collapses or not is then irrelevant. 49. “Do we really need new evidence and arguments about the Turin Shroud?” by Tristan Casabianca. Since the 2000’s, the discussion about the authenticity of the Shroud of Turin has been reopened in mainstream scientific journals. Over the last few years, new global arguments regarding the ongoing controversy have been introduced. This paper argues that the dozens of recent scientific articles reinforcing the authenticity hypothesis and the development of analytical arguments show that the belief in the authenticity of the Turin Shroud is justified. But, even if new evidence and arguments are crucial in order to show what a reasonable answer should be, human beings can always, as free agents, hold unwarranted doubts and beliefs. 50. Panel discussion on image formation. 51. “Where are We Now and Where do we go from Here?” by Mark Antonacci. This presentation discusses new areas of minimally-invasive and non-destructive testing, which has never been performed on the Shroud before and could reveal far greater quantities and qualities of evidence than could ever have been imagined in previous eras. This testing could even reveal extensive and unforgeable evidence of some of the most ultimate truths and important events in human history. 52. “A Robust Statistical Analysis of the 1988 Turin Shroud Radiocarbon Dating Results” by M. Riani, A.C. Atkinson, G. Fanti, and F. Crosilla. Samples were cut from the Shroud of Turin in 1988 and sent to three laboratories for carbon dating. The results for 12 measurements, with the statistical analysis of these values, was published in NATURE (Vol. 337) in 1989 by Damon et.al. A robust statistical analysis was done on the results reported in Damon in order to test the conclusion in Damon that the Shroud of Turin is mediaeval. It was found that the values of the 12 dates are not consistent with the stated uncertainties under the assumption that only random measurement errors are present, i.e. the results are not homogeneous. A total of 387,072 ways were considered to sub-sample from the samples sent to the three laboratories. Analysis indicated that the radiocarbon date results likely depended on the location on the Shroud from where the samples were cut, and that the small sample sent to Tucson was probably not used in the results. This was later confirmed.